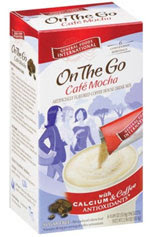 If you want to save some money and like Mocha drinks, try this! I have tried this and it is just as good if not better (IMO) than most of the hot drinks out there. It is sweeter than McDonald's, I think and not bitter at all. There are 5 individual packets for about $2.99 at Walmart, a bit more money at the grocery store. If you live in the cold, you are going to want to get your favorite blanket and a watch a good movie and stay in! And think of the money saved!